U.S.-bound Central American migrants march to the office of the U.N. human rights body in Mexico City, Nov. 8, 2018. 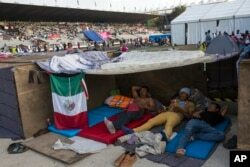 Central American migrants rest at the Jesus Martinez stadium in Mexico City, Nov. 6, 2018. Humanitarian aid converged around the stadium in Mexico City where thousands of Central American migrants winding their way toward the United States were resting Tuesday after an arduous trek that has taken them through three countries in three weeks.